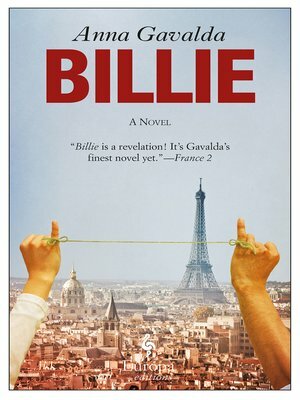 A number 1 bestseller in France and translated into over twenty-five languages, Billie is one of the most beloved French novels to be published in recent years. A brilliant evocation of contemporary Paris and a moving tale of friendship, Anna Gavalda's new novel tells the story of two young people, Billie and Franck, who, as the story opens, are trapped in a gorge in the Cévennes Mountains. Billie begins to tell stories from their lives in order to calm herself and Franck as darkness encroaches. In alternating episodes, the novel moves between recollections of the two characters' childhoods and their dire predicament. Franck's life has been impacted by a childhood spent with a perennially unemployed father who toyed with Christian extremism and a mother aestheticized by antidepressants. A bright kid, Franck's future was menaced at every turn by the bigotry surrounding him. As for Billie, her abiding wish as an adult is to avoid ever having to come into contact with her family again. To escape from her abusive and alcohol-addled family, she was willing to do anything and everything. The wounds have not entirely healed. At the heart of Gavalda's moving story lies a generosity of spirit that will take readers' breath away, and an unshakable belief in the power of art to lift the most fragile among us to new vistas from which they can see futures full of hope, love, and dignity. Billie is a beautifully crafted novel for readers of all ages and from all walks of life that conveys a positive message about overcoming life's trials and tribulations.